Walking is one of the great pleasures of life. We often take it for granted how easy it is to get up and walk to the bathroom or take a leisurely stroll through a park. There are many health conditions that make it hard for people to walk. 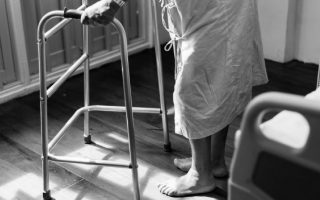 People age and begin to feel unsteady when walking, they may have surgery, back problems and need extra support or just cannot keep up the endurance that they use to have. They need to have something that brings walking back into their lives. To lead a happy, healthy life one needs to take advantage of the medical equipment that is available. A walker or rollator is a piece of medical equipment that enables a person to continue walking with safety. It helps to prevent falls and gives people the freedom to walk safely. Today there are many choices available to meet your needs. This site explains some of the styles and options available to you. Start by talking to your doctor or physical therapist about which type of walker best suits your physical needs. Get a prescription from your doctor for a walker if you are on Medicare, or if your health insurance offers a reimbursement. Soon you will be up and walking safely again. Walkers and rollators come in many styles. Features include: three legs, four legs, wheels, bench seats, baskets, folding-collapsing for transporting, some are made to use in rugged terrain. Several models are also a transport chair that offers a combination rollator/wheelchair. It is very important to take the time to choose a walker or rollator that will best fit your needs. Begin by visiting your doctor or physical therapist. 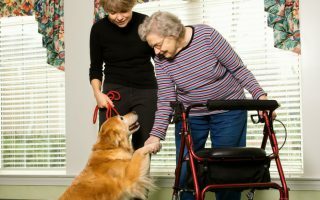 Discuss with them what your needs are and how you plan to use a walker. Below is a list of questions you should think about before purchasing a walker. 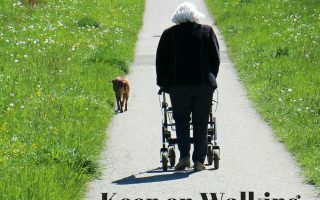 Do you need to sit down frequently when walking? Will you be walking outdoors? Does the Walker need to fold to fit in your trunk? Are you strong enough to use hand brakes? What is the weight limit of the walker-Rollator? Will you be carrying objects with your walker? Will you need a seat or basket? Do you want to take your walker on an airplane? Medicare will help pay for a walker and get a new one every five years if you meet the Medicare requirements. Follow the requirements carefully for reimbursement. Walkers also make a great gift for a loved one. When my mother received her first walker she was so excited. She called it her new set of wheels. She finally could get outside and walk around the senior campus. When she got tired, she simply sat down for a little and enjoyed the great outdoors. Just because you have a walker-Rollator doesn’t mean you need to give up your sense of style. There are many ways to accessorize your walker. Add a stylish tote bag,, a cell phone holder, water bottle holder, a flag or a horn. Be creative and make your walker unique. Decorate for the holidays – add a flag on the Fourth of July, a few lights at Christmas or a horn to greet the New Year. Walkers need to be maintained on a regular basis. Check the brakes, wheels, nuts and bolts. If you are unable to do the maintenance yourself, ask a family member or friend to check the safety of your walker rollator. This site is a resource for you to start your search for the best rollator or walker that will fit your needs. Take the time to analyze the styles and benefits of each type. 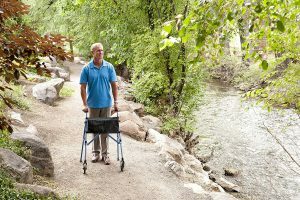 A walker rollator will bring you many years of safe walking and get you out of your chair with the freedom to walk again. Once you find a style or brand search for the best price online. This video shows how an All Terrain walker can take you places that you thought were impossible.